(Nanowerk News) On the way to the production of environment-friendly fuels from biomass residue, the Karlsruher Institut für Technologie, or KIT for short, in cooperation with the technology partner Air Liquide Global E&C Solutions has realized another important milestone: the second process stage of the bioliq® pilot plant is ready – today, the complex high-pressure entrained flow gasifier bioliq® II was handed over for operation. The four-step process designed at the KIT allows producing valuable and engine-compatible design fuels für diesel and Otto engines. The bioliq® plant at the KIT: in a multi-stage process, high-grade synthetic fuels are produced from straw and other biogenic residues. The entrained flow gasifier in step II converts the liquid intermediate product bioliqSyncrude® obtained in the first process step into a tar-free synthesis gas. In pilot mode, it may optionally be operated at two pressure levels (40 bar and 80 bar) which provides maximal flexibility, depending on the requirements of the downstream pro-cess steps. With the completion of bioliq® II, an important milestone on the way to the operation of the complete process chain from biomass to motor fuels has been reached. The entrained flow gasifier was provided with a special plant design. It offers the advantage that a variety of biomass containing even high ash concentrations can be processed. The applied materials of constructionare able to withstand the corrosive effects caused by biomass components and allow for operation at high pressures. This ensures operation of the entrained flow gasifier at conditions that are close to commercial-scale operation – consequently, the pilot plant functions as an important research platform at the KIT. “The entire bioliq® process is exemplary for the sustainable utiliza-tion of biomass and is making a vital contribution to the substitution of fossil energy resources and to curbing CO2 emissions in the transport sector”, stressed the KIT Vice President Research and Innovation, Dr. Peter Fritz. “With the high-pressure entrained flow gasifier the KIT Energy Center now utlilizes an excellent tool that is more than just proof of the commercial-scale capability of the bioliq® process”, asserted the Project Manager of bioliq® II, Professor Thomas Kolb. “It is bound to also generate important research results in the area of high-temperature processes and thus to contribute to the development of new technologies.” Kolb referred in this context to the research cooperation initiatives already launched during the construction period, such as the virtual Helmholtz-Institut HVIGasTech (http://www.hvigastech.org) which bundles the scientific and technical competencies of the partners and transforms them into new know-how relating to thermo-chemical processes operated under high pressures. “As the bioliq® process relies on straw and other biogenic residues which do not compete with food or feed production, we are thus in a position to make a substantial contribution to the development of alternative energy solutions”, said François Venet, Vice President Air Liquide Global E&C Solutions. “We are proud to have successfully implemented this challenging and strategically significant new technology of converting biomass into syngas jointly with our cooperation partner KIT and are highly satisfied to have been able to strengthen further our portfolio in the field of “Renewable Resources”. The multi-stage process takes account of the fact that, on the one hand, biomass residues occur highly fragmented regionally and, on the other, it is imperative to establish an economically viable, commercial production scale. The construction of the pilot plant at KIT Campus Nord is subsidized by the Federal Government and the Land Baden-Wuerttenberg. Besides numerous institutes and service units of the KIT, several industrial partners partake in bioliq®. 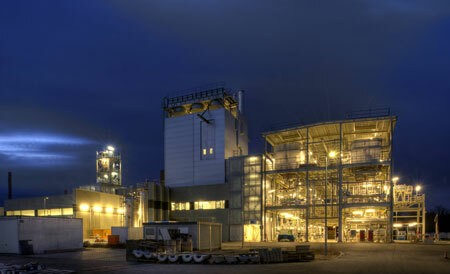 The construction of bioliq® process stage II has an investment volume of around EUR 28 million. 50 percent of this amount is contributed by the Federal Ministry of Food, Agriculture and Consumer Protection (BMELV). These funds are made available via the Fachagentur für Nachwachsende Rohstoffe e.V. (FNR). The balance of the capital expenditure is borne by the KIT and the industrial partner Air Liquide Global E&C Solutions at half each. Air Liquide Global E&C Solutions not only planned, designed, supplied, constructed and commissioned the plant for the bioliq®-process stage II, but will also participate in the further research and development work. The complete bioliq® Process (Biomass to Liquid Karlsruhe) comprises four stages. In Stage I, the dry residual biomass which occurs widespread regionally and possesses low energy content is converted decentralized into a substance similar to crude oil of high energy density by fast pyrolysis. The so-called bioliqSyncrude® can be transported cost-effectively over long distances and is processed further centrally. In the second process stage, a high-pressure entrained flow gasifier converts the bioliqSyncrude® to a tar-free syngas at temperatures above 1,200 degrees centigrade and pressures of up to 80 bar. The synthesis gas is mainly composed of carbon monoxide and hydrogen. In this Stage II, the high temperatures, high pressure and the reactive products make exacting demands on the process, the instrumentation and the safety technology of the plant. The downstream hot-gas cleaning unit – Stage III – has the function to separate impurities like particulate matter, chlorine and nitrogen compounds from the syngas. In the fourth and last process step, the gas molecules are selectively composed to obtain customized motor fuels.